Living alone, I hate to heat the stove for a big pan. This size is perfect. To me, the handle is a pain to put in, so I don't take it out. The pan is small enough that I can store it easily. One thing is buggy though, the description mentions a light....mine does not have one. 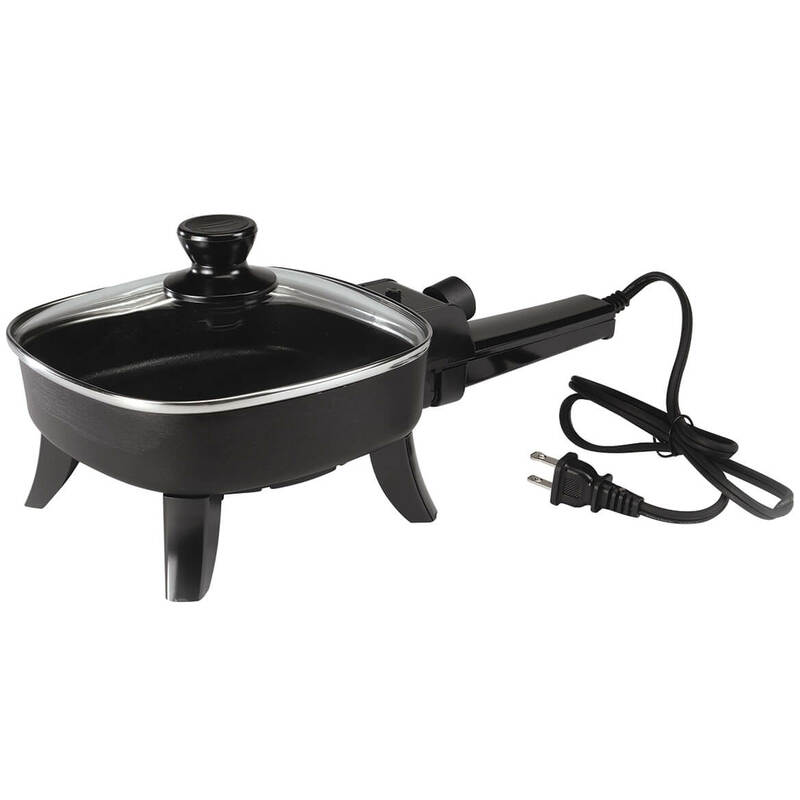 My recent purchase of the electric frying pan was a very good experience. The wait for shipping was less time than I expected. The product is very good. Being a widow and cooking for one makes it easier to clean up. Very good product. This is a great size when I am cooking something small for me and my husband Thank you. I have used this small skillet for many months now and love it.. I live alone and its perfect for me. great for college kids too! this is great for small, quick meals. great for college dorms too. My husband and I drive a truck over the road. The compact size is great since our storage is limited. The size is great for the two of us. I ordered two of them. I love them. I haven't found anything yet that I don't like about them. LOVE, love this skillet! I have 3 of them now!! Perfect size for grilled cheese, a couple eggs - anything! When camping, I add water to the skillet and put of bowl of chili and cheese to melt for a dip! This is a must have for your kitchen. It heats up easily and consistently. 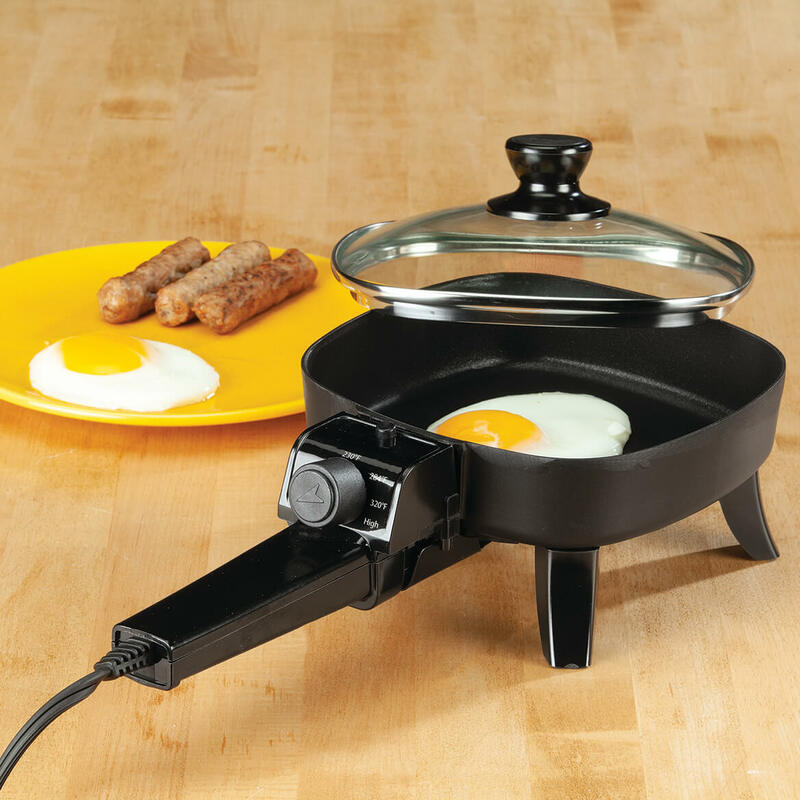 No dragging out the huge electric skillet just to fry an egg or make a grilled cheese sandwich! I would like to buy this product again and again! Being a single lady, the mini-skillet is perfect for a burger or a couple eggs, and great size for a grilled cheese sandwich. I had one before that I used so much, it wore the Teflon off! Time for a new one! Keep offering this product!! Walter Drake, Has good, quality products and ships promptly. Be sure to put unit on heat proof pad as bottom gets very hot and can burn the countertop. I burned my hand the first time I used it. This cooks good & takes up small space. Would be better if it were a better quality finish. We purchased this for the office. Makes great sandwiches and eggs in the morning. Easy to clean and store. Size is only problem due to only one sandwich at a time. You need to be careful when using anything with a sharp edge in the pan as it scratches easily. saves cooking oil, use less than a full size skillet. Love that. The size is perfect for making small amounts of food. Very convenient. Warm Food all the times . It is just so handy . I take it to my work & heat my lunch all the times . I took it to my vacation & heat my left over dinner after late nite movie. I like it so much . So far it has had the results that I had hoped for, small and easy to clean. I gave this little electric skillet to my family that travels in a camper and they are just thrilled with it! They had been looking for one for a long time and couldn't find one. I told them that I had seen one but couldn't remember where. You then sent me your booklet and there it was! Thanks for letting me help my family! looks a little cheeply made. haven't used it yet. Buyer Beware. I received a product that was not quality tested and was a safety hazard! The temperature setting knob was set to "off", however, an electrical current spark was set off as I was about to plug it in, immediately tripping the safety outlet and tripping the main house fuse. My son-in-law took it apart: The Left side of the frying pan handle had a large burnt area and there was a current even though the knob was set to "off". The frying pan handle is suppose to click and be secure – it was not, not at all. This little skillet was exactly what I was looking for and I'm very disappointed it didn't work. I don't trust another exchange replacement item. Customer service was quick to refund my money, however, the shipping and processing fees were not refunded – which was almost $9.00. I can not afford to waste money, to gamble on products like this, so I am no longer shopping with this company. I usead it once and I had to trow it away because once i wahed it the surface wasted away. It is slow to heat but the worst part is that it doesn't get very hot even at the highest setting. Tis product is perfect for fixing amsll meals, and I like the looks of it. Live in a small apt. Thanks Marie jenkins, Tucson, Arizona, 85705. It is just the right size for one person. Ideal for my sister who has no stove. I only cook 2 eggs in the morning! Single person living alone. Looks perfect for me. Perfect to make 1 egg. My friend rents a small room & does not have a kitchen. Always looking for ways she can prepare food in a very small space. To make small, two person, batches of country fried potatoes and still leave the cooktop open. So I can cook one pork chop at a time or one helping of anything to be fried without wasting oil on big pan. II often like an egg for breakfast..This size will be great for me. I would rather have a small frying pan to cook for myself rather than the stove ... it's convenient, small and handy. this will be my second one ... had the other one for years ..
needed something for our camper. kitchen stove is not working. Perfect size for small kitchen space and excellent for cooking for 2. Great portion control! It is easier for me as I live alone. Not having to do Clea up. Wanting something smaller for on the go. For washing, it's not easy to get the handle off and then back on. I need a small pan for a small space. easier to use than the stove. wanted something small to cook for 1. BEST ANSWER: I bought this for our RV and that is where it is so as for the cord length I would guess 3ft, not very long but long enough to put it on the counter and reach the outlet. Great for individual items. From where the cord attaches to the tip of the metal prongs it is 24 and 1/2 inches. tell me if this is that brand or not? BEST ANSWER: Thank you for your question. This is not made by Elite. We hope this information will be of help to you. I purchased this pan because there is only two of us. Mine works just fine - have no issues with it. What is the brand name? Where was it made? Thank you. BEST ANSWER: Thank you for your question. Unfortunately, we are contractually obligated not to provide any manufacture information including brand name. We apologize for any inconvenience this may have caused. Is the heating element enclosed on the bottom of pan?. where can I buy just the cord lost mine? BEST ANSWER: Read the paper work that came with the skillet. That is the only way you can get a new cord. anyone know where you can get replacement legs? It's made by Continental.